I had high expectations for this Bible, and was not disappointed when it arrived last week. 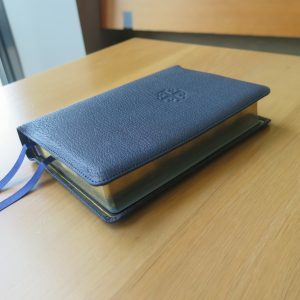 This Bible is basically a simple, yet elegant, desk Bible. 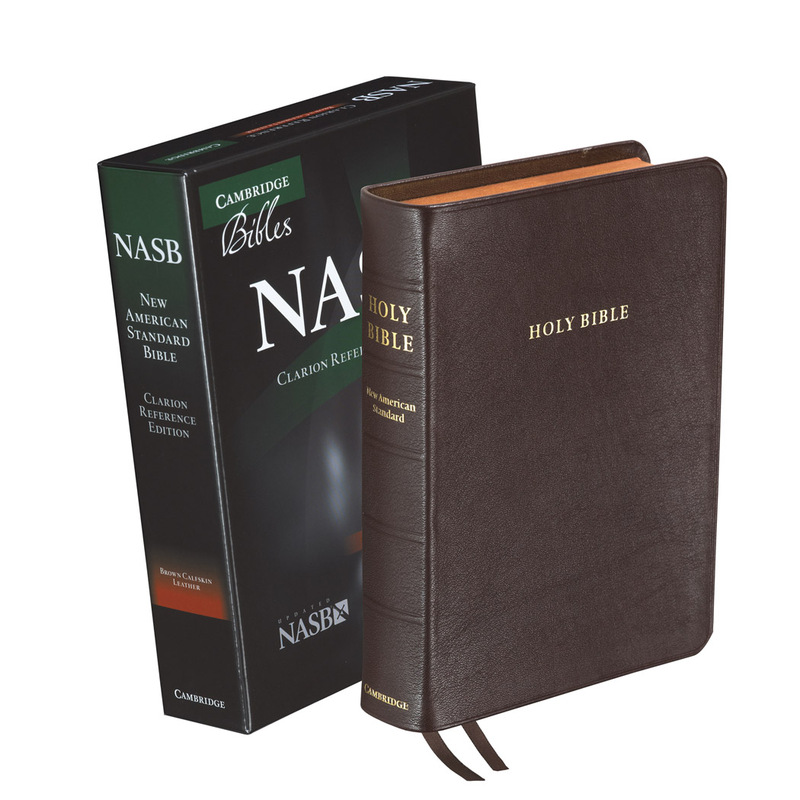 It has a no nonsense design, yet exudes the dignity of a mini pulpit Bible. 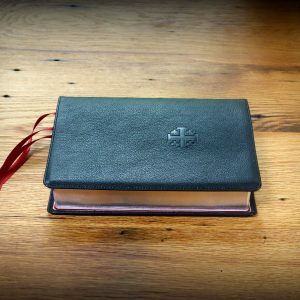 This is not a Bible one would tote to church or Sunday School or Bible study. 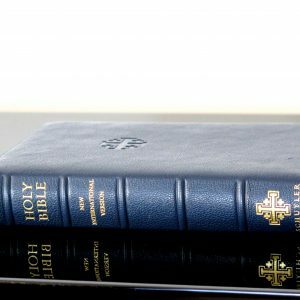 It is a Bible that invites a sense of “settledness” and focus as it lies on the desk in front of you. Page and print are nearly flawless (at least in my copy). 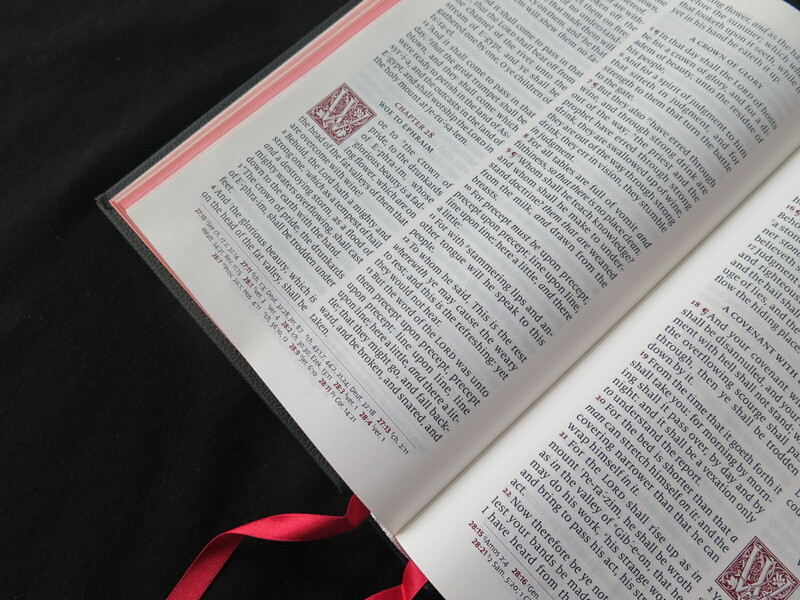 If you are looking for a simple, elegant, AND functional design, this Bible makes for a great Reader. 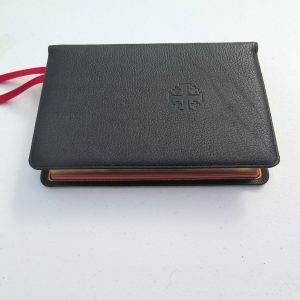 Beautiful longer wider ribbons than calfskin edition.. Hardcover corners that don’t feel sharp because of the nice thick leather. The plain front cover without logos looks better. Pld fashioned 1800’s style color end liner papers ! A lovely amount of flex is built in, that you never find in hardcover books ! Much easier to hold & read than the goat or calf. 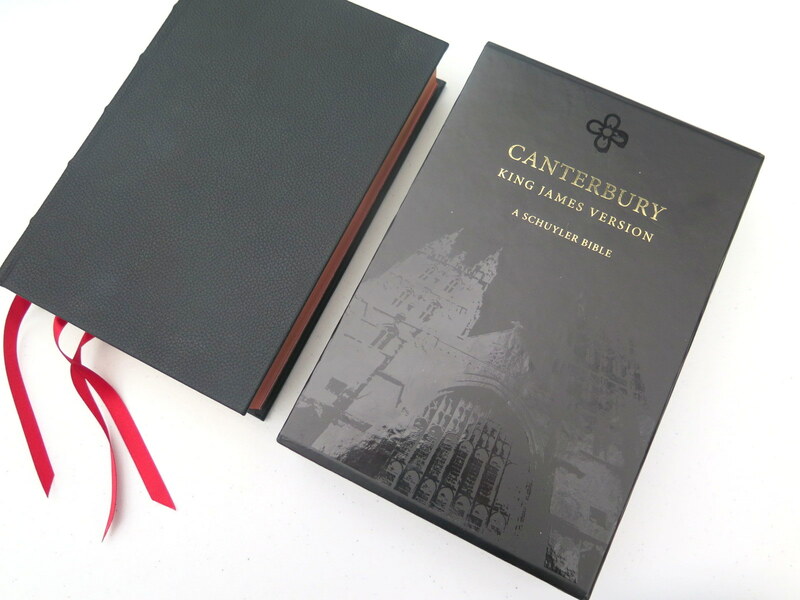 This is the best edition & best price of all the Canterbury Bibles ! Even the cardboard storage box has thick ends to hold the Book vertical without sagging. 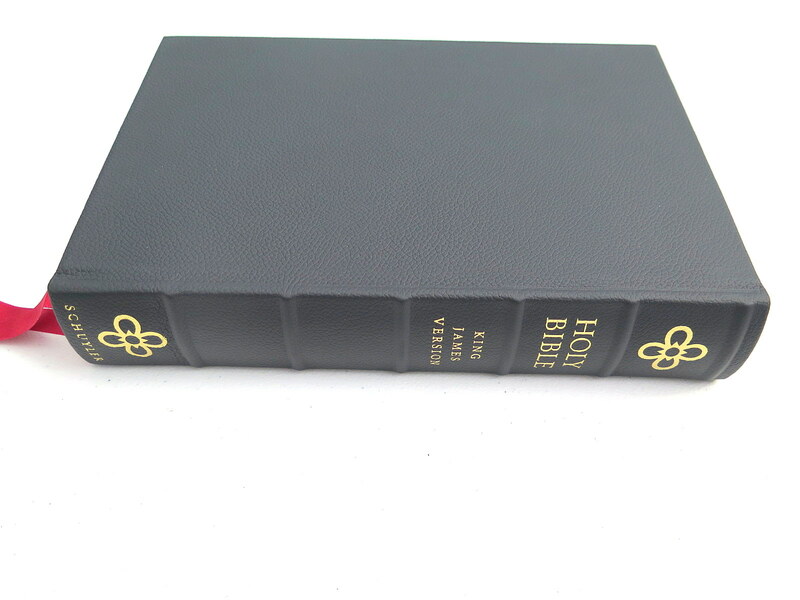 The calfskin Bible is too big & floppy to hold in 1 hand to read, but this HC is perfect & enjoyable to use. Looking forward to a 2nd generation new edition without self-pronouncing text , built better with 45gsm paper ! 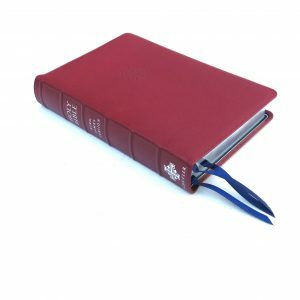 Schuyler Canterbury KJV Cowhide-Over-Board This bible is simply beautiful. Love everything about it! I’d buy it again and again. 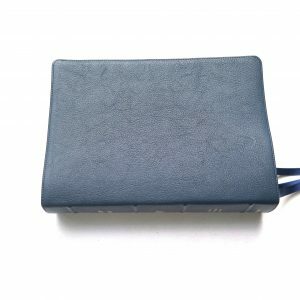 I received my copy of the leather over board Cantaburry in about 5 days. It is a beautiful work of art ! 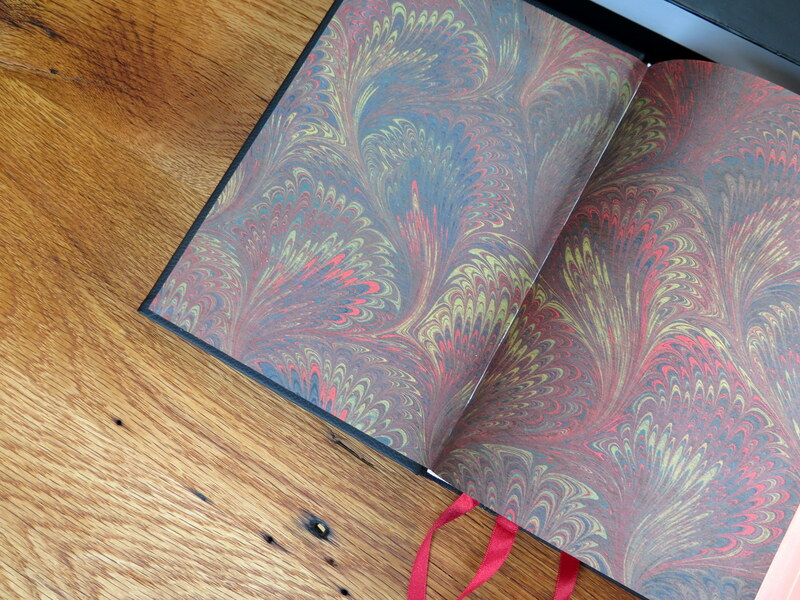 The inside cover is a very colorful and attractive paisley design. 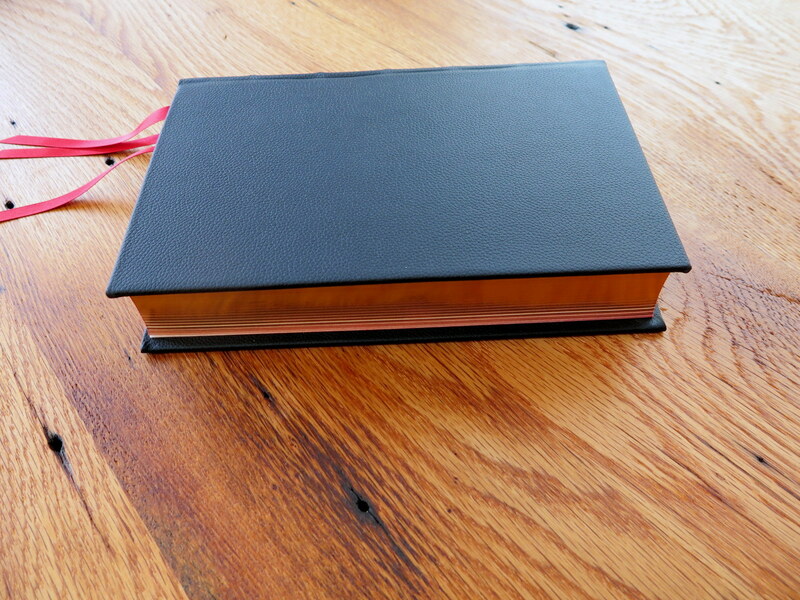 The book block is like the goatskin soft covered bibles except the leather over board page is square not round. 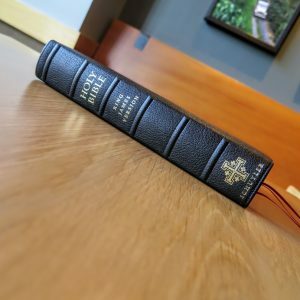 The ribs on the spine, self pronouncing text, along with the artistic letter at the beginning of every paragraph gives the Cantaburry leather over board an ” Old School ” Classic look and feel, but adds to the joy of reading Gods Word. Thank God for His Word and Thanks to the Clines and Evangelical Bible. is the only Schuler Canterbury not yet available. 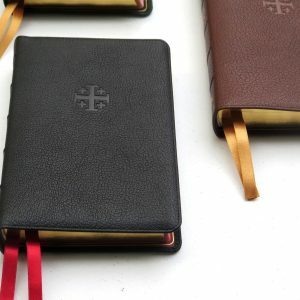 Since the present Canterbury small hardcover is the most modern perfected Pulpit KJV Bible , let’s hope for the large 300 -$400. in the same slipcase ! I’ll just keep this simple, because there’s just not enough words that would Express the exemplary quality of this Bible. 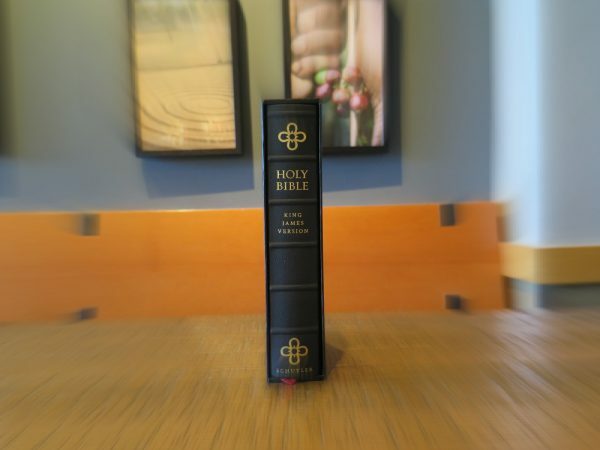 The best way I can put it, is..
Twenty-five years ago, I figured out that a hard cover Bible is easier to read because it does not flop around like a Basset hound dog’s ears. It is beautiful, lovely to hold, and it is my favorite of the three Schuyler Bibles that I have owned. I would give this Canterbury edition 5 stars, but for a very obvious misrepresentation of it description. This Bible does NOT have self-pronouncing text. What it does have, are words separated into their individual SYLLABLES. This is not the same thing. There are no indications of how each syllable should be read or spoken. Only which one should be emphasized. Are the vowels long or short in the word E´-phra-im? Is the ‘E’, ‘eh’ or ‘ee’? Is it ‘fray’, ‘frah’ or ‘fruh’? There is nothing to guide the reader in the pronunciation. There is nothing remotely ‘self-pronouncing’ about breaking a word into its syllables. And it actually borders on the absurd, to apply this to words like ‘A-dam’ or ‘A-men’. EVERY time they are used! Are KJV readers that ignorant, that they need help pronouncing ADAM? Evidently Schuyler thinks so. I’m glad they didn’t do this with Je-sus. Or Mo-ses. I guess there is still some hope for we KJV folks. Otherwise, this is a nicely bound book, and has one of the nicest formats of any I’ve seen or held. If you can put up with the ridiculous separation of words into syllables, FALSELY ADVERTISED as ‘self pronunciation’ – then it would be one to buy. 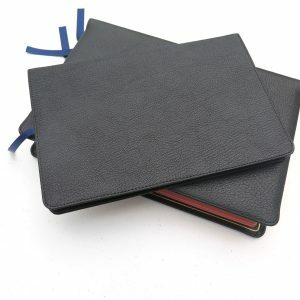 But to spend the cash on one of these in the goatskin or calfskin, knowing this about them? I’m glad I didn’t! 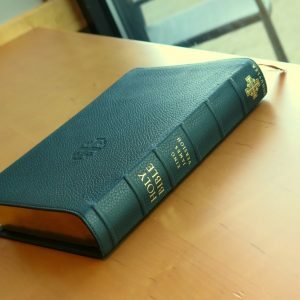 I received my Schuyler Canterbury KJV Cowhide-Over-Board ( Imperfect ) Bible, on Friday, 23 November 2018 , the day after Thanksgiving. I must say I was quite pleased and surprised with the Copy of the Scriptures. I nor my wife could not see the Imperfection(s) that was said to be on the Bible! I am sure they are there after looking at the Gilding and examining the Book over completely several times it was minor to say the least. The covering was soft and smooth to the touch. and inside the Scriptures to turn the pages was a delight as well as a dream. 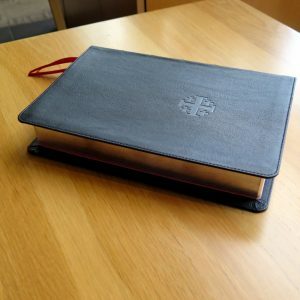 I do not plan to write in this , I have several High End Bibles that I do not write in. I keep them un-sullied for my children and Grand-children when we are gone. We really like the Drop Down Caps at the begging of every chapter. That atractted me to the Schuyler Company in the first place. Now that I have a Bible in my possession I can see why people talk the way they do about them. I could go on Then I would be rambling. I just want to thank you againg for this. Have a Happy Holidays or However you Celebrate them! Merry Christmas to your Staff and Families. We really like the Drop Down Caps at the beginning of every chapter. That attracted me to the Schuyler Company in the first place. Now that I have your Bible in my possession, I can see why people talk the way they do about them. Their are many other features in the bible that I really like. The Section on the King’s English, The Very Detailed Maps. The Concordance. I could go on Then I would be rambling. I just want to thank you again for this Bible. PS : I had to re-write this post for all the lousy spelling and terrible punctuation.